Here's the latest Chimney Tops 2 Fire Update as of this evening. This was just posted on the new Chimney Tops 2 Fire Facebook page (see additional updates below). Incident Summary: The Chimney Tops 2 Fire was reported in Great Smoky Mountains National Park near Gatlinburg, TN on Wednesday, November 23, 2016 at approximately 5:20 p.m. The wildfire began burning in a remote location (Chimney Tops) of the park in steep terrain with vertical cliffs and narrow rocky ridges making access to the wildfire area difficult for firefighting efforts. On Monday, November 27th, continuous exceptional drought conditions and extreme winds caused the wildfire to grow rapidly, causing numerous new wildfire starts from embers carried miles away and downed powerlines in and adjacent to Great Smoky Mountains National Park. The wildfire was determined to be human-caused and is currently under investigation. To date, there are 7 confirmed fatalities and 700 confirmed structures lost (300 in Gatlinburg, 400 in other parts of Sevier County). The Southern Area Red Team assumed command of the Chimney Tops 2 Fire today, Wednesday, November 30th, 2016 at 8:00 a.m. The Red Team, the Type 3 Grey Incident Management Team from Colorado, and other firefighters and equipment are on site. Chimney Tops 2 Fire is currently burning in brush, hardwood slash, and leaf litter. Fire crews are working to assess fire damage and coordinate with local resources to provide structure protection. From our Fire Behavior Analyst, “The area around the Chimney 2 Fire received rainfall today ranging from 1.2 to 1.7" as of 3:30pm. The same area has been experiencing drought that has persisted over the past four months. Knoxville has received only 2.24” of rain over past 100 days, 13.48 is normal for same period. The rainfall received today will only last for 1 to 2 days due to prolong drought. Fire activity will increase until significant rainfall is received over several days. Indices used to predict fire danger were at or approaching all-time highs before the rainfall. These indices will start to move back towards the same level as before the fire over next couple days if no rainfall is received”. This means the rain we received may have slowed this fire for a day or two at a critical time, but the threat from this fire is still there. Weather: Temperatures are expected to decrease as the week progresses, with afternoon highs reaching the 50s and 60s. Relative humidity is predicted to increase; however gusty winds may still contribute to active fire behavior. You can click here to see the latest forecast for the area. • Great Smoky Mountains National Park and trails are closed from the Gatlinburg entrance along Highway 441 to Smokemont, near Cherokee, North Carolina. Cades Cove and Oconoluftee Visitor Centers of Great Smoky Mountains National Park have re-opened today. • A mandatory evacuation is still in effect for most of the City of Gatlinburg. You can click here to view a map of the impacted area. * According to latest InciWeb update, officials don't expect any spread over next 12 hours due to rainfall today. "a cold front pushed through the fire area Wednesday producing significant rainfall. Amounts across the area ranged from 2 to 5 inches. Although the rainfall reduced fore behavior, exceptional drought conditions persist across the area. Some roads may be slick due to mud and ash while low lying areas may still contain pools of standing water. High pressure will build back into the region Thursday through Saturday with the next chance of rain arriving Saturday night and Sunday." * However, over the next 72 hours: "After 3 days of drying, fire behavior should be increasing. Fire spread in the timber litter should be expected. 1-2 ft flame lengths with minimum rates of spread of 1-3 chains per hour." * Major-major kudos to Dolly Parton!! She just announced tonight that her foundation will donate $1,000 per month for each family who lost their homes in the fire. Inciweb, the Federal incident information system, has published a map of the Gatlinburg fire area. You can click here to see an enlarged version of the map. The fire so far has impacted 15,653 acres in the area. Great Smoky Mountains National Park officials have announced this evening that LeConte Lodge, the popular backcountry lodging facility at the base of Mount LeConte, and the Elkmont Campground and Historic Districts sustained no damage from the fire activities in the park on Monday evening. Some Elkmont buildings sustained roof damage from falling trees caused by heavy winds, and some roof repairs will be required. The fires in the park and Gatlinburg community have now collectively been estimated to total over 15,000 acres. Tomorrow, November 30, the park will turn the fire management operation to the Southern Area Type I Incident Command Team (Dueitt) to manage the ongoing fire activities within the park. This team consists of federal and state interagency team members from across the country who collaboratively manages wildland fire and other incident management activities such as natural disaster relief efforts. Local officials in Pigeon Forge have lifted the mandatory evacuation order. Gatlinburg still remains under a mandatory evacuation order. Pigeon Forge officials estimate 500 people were evacuated on Monday night. Approximately 125 people remain displaced and in local shelters in Pigeon Forge. State agencies and local officials evacuated likely thousands residents and visitors from Sevier County last night due to devastating wildfires in-and-around the cities of Gatlinburg and Pigeon Forge. It is very likely 14,000+ residents and visitors evacuated from Gatlinburg alone. The Chimney Top Fire, which began in the Great Smoky Mountains, spread very rapidly yesterday evening as high winds pushed flames onto private property. Numerous roads remain closed and blocked by fallen trees and power lines. State Hwy. 441 heading into Gatlinburg is closed, except for emergency traffic. State Hwy. 441 leaving Gatlinburg is open to evacuating traffic. Gatlinburg is blocked off to the public and local officials are not providing access into the city because it is still a dangerous situation. Local officials will announce when they are ready to allow residents back into Gatlinburg. Gatlinburg officials also have not had a chance to do a complete and through assessment of damage in Sevier County. So it is unknown at this time of an exact number of structures damaged or destroyed in Sevier County by the wildfire. Sevier County officials report 14 injuries and three fatalities. There is no other information available at this time. Three persons with severe burns were transferred form University of Tennessee’s Knoxville (UTK) hospital to Vanderbilt Medical Center in Nashville overnight. A fourth with burns to their face continues to be evaluated at UTK. Currently, there are no reports of fatalities. Sevier County reports 10,693 people without power. At peak, an estimated 1,300 people occupied six Red Cross or independently-operated shelters. The latest estimate is 1,100 occupants in the three shelters above. Tennessee Department of Transportation (32 personnel) crews and trucks have been working continuously overnight to help clear routes of ingress and egress, fire fighters and apparatus from scores of jurisdictions responded with mutual aid. The Tennessee National Guard is activating 111 soldiers to assist with movement of first responders, light debris removal and well ness checks. The Tennessee Wildlife Resource Agency has 15 personnel also assisting with the searches and wellness checks. The Tennessee Emergency Management Agency worked with the Federal Emergency Management Agency this evening to secure a Fire Management Assistance Grant (FMAG) for the Chimney Top Mountain fire, which caused the wildfire outbreak in Sevier County. A line of strong to marginally severe storms is expected in East Tennessee tonight and into early Wednesday morning. Damaging straight-line winds up to 60 mph are the primary threat. Heavy downpours and lightning will also accompany these storms. * Total acreage burned is now estimated at 15,000 acres. * Pigeon Forge has halted evacuations and most businesses are now open. * Gatlinburg has canceled the annual "Fantasy of Lights" Christmas parade that was set for Friday. * WBIR is reporting that both the LeConte Lodge and Elkmont are intact. Here's a list of the status of several businesses and buildings in the area. * During the press conference this afternoon, the Gatlinburg mayor announced that a "Gatlinburg Relief Fund" has been set-up. Knox News has posted information on their website on several ways you can help the victims of the fire. Even with the rain that is currently falling there, the fires continue to burn and structures remain engulfed with little hope that the rainfall will bring immediate relief. Additionally, the Tennessee Emergency Management Agency has liaison officers in Sevier County and has activated the East Tennessee Regional Coordination Center to facilitate resource requests and mission assignments. Sevier County reports 11,595 people without power. At a peak, an estimated 1,300 people occupied six Red Cross or independently-operated shelters. The latest estimate is 1,100 people in four shelters. Tonight, a chance of showers and thunderstorms, then showers likely and possibly a thunderstorm after 10 p.m., Eastern. Mostly cloudy with a low around 59. Breezy, with a south wind 5 to 10 mph increasing to 15 to 20 mph after midnight. Winds could gust as high as 35 mph. Chance of precipitation is 70 percent. WBIR has published some information on how you can help fire evacuees - please click here. Sevier County, City of Gatlinburg, and Great Smoky Mountains National Park officials have reported widespread fire damage and continued fire activity throughout the Gatlinburg area and much of Sevier County including Wears Valley, Pigeon Forge, and Jones Cove. Gatlinburg City officials have reported numerous structures completely lost to fire including businesses in the downtown area and private homes throughout the area. Unpredicted, extreme weather conditions on Sunday afternoon through Monday led to the exponential spread of fires both inside and outside of the National Park. Severe wind gusts of over 80 mph, unprecedented low relative humidity, and extended drought conditions caused the fire burning in the National Park to spread rapidly and unpredictably, in spite of suppression efforts on Sunday that included helicopter water drops. Wind gusts carried burning embers long distances causing new spot fires to ignite across the north-central area of the park and into Gatlinburg. In addition, high winds caused numerous trees to fall throughout the evening on Monday bringing down power lines across the area that ignited additional new fires that spread rapidly due to sustained winds of over 40 mph. Conditions remain extremely dangerous with trees expected to continue to fall. Officials are asking that motorists stay off the roadways throughout the area. Travel in the Gatlinburg area is limited to emergency traffic only. The National Park is closed at the Gatlinburg entrance. Officials have received tremendous support throughout the region included state resources and the deployment of the National Guard by Governor Haslam. The Red Cross established shelters in both Gatlinburg and Pigeon Forge where over 1,300 people have gathered to seek refuge. At this time, officials do not have information to release regarding the current size of the fire, the number of structures burned, or injuries. Additional news updates will be provided as information becomes available. 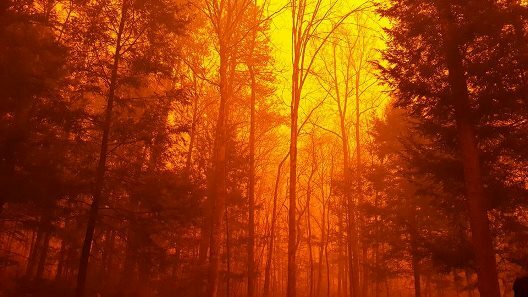 Great Smoky Mountains National Park officials have closed all facilities in the park due to the extensive fire activity, and downed trees. Park Headquarters is currently without power and phone services. 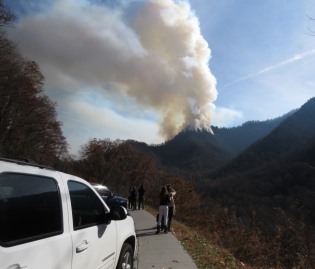 Great Smoky Mountains National Park officials have closed Newfound Gap Road, Cherokee Orchard Road, Elkmont Road, and several trails due to the Chimney 2 Fire. The fire has grown to approximately 500 acres in size overnight due to extreme, sustained winds over 20 mph. National Park Service fire crews are focusing on suppression efforts to ensure public safety and protect park facilities at locations such as Chimneys Picnic Area. The fire is currently moving northeast, burning primarily along the ground layer through duff and leaf litter. Gusting winds have caused the fire to spot across the ridges in the Chimney Tops and Bullhead Ridge areas. On Sunday, November 27, three helicopters dropped water throughout the area to help suppress the fire over the extremely steep, rough terrain. Currently park firefighters have been joined by firefighters from Utah and additional support resources have been ordered, including an incident management team along with 4 hand crews (total of 80 people) and air support. Additional ground firefighters were also requested to help with suppression efforts in anticipation of predicted winds for Monday afternoon. Backcountry areas are unsafe for travel and the following trails and backcountry campsites are currently closed until further notice. Closed Backcountry Trails include Chimney Tops, Road Prong, Huskey Gap, Sugarland Mountain, Rough Creek, Little River, Cucumber Gap, Jakes Creek, Miry Ridge, Goshen Prong, Old Sugarlands, Bullhead, Rainbow Falls, Alum Cave, Brushy Mountain, Trillium Gap, Baskins Creek, Porters Creek, and Grapeyard Ridge trails. Closed Backcountry Campsites include 21, 23, 24, 26, 27, 30, 31, 32, Mt. Le Conte shelter, and Mt. Collins shelter. The cause of the fire near Chimney Tops appears to be human caused and is under investigation. If anyone has information regarding the origin of this fire, or other fires in the park, please call the park’s Tip Line at 865-436-1580. Great Smoky Mountains National Park officials reported additional fire activity including the Park Headquarters area and a spot fire between Elkmont and Newfound Gap Road off of the Sugarland Mountain Trail approximately 1 mile south of the Husky Gap Trail intersection. The park has closed the Gatlinburg Bypass and Little River Road from Sugarlands Visitor Center to Metcalf Bottoms Picnic Area due to fire activity and downed trees. The park has evacuated employees from the Elkmont and Park Headquarters housing areas. Due to continued erratic winds, the fires are very unpredictable and more fire growth is expected. Wind conditions continue to worsen with 40 mph average winds being recorded and 74 mph gusts. WBIR is now reporting that Gatlinburg fire officials have declared a mandatory evacuation for some neighborhoods in Gatlinburg. Fortunately rain is expected tonight - likely to arrive around 11:00 or so. Hopefully it's not too late before any major damage is done. Update 2: WATE is reporting that downtown Gatlinburg is being evacuated. 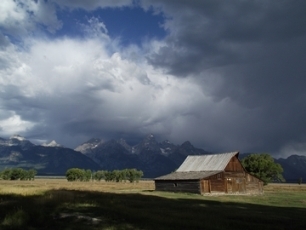 The fee free days gives hikers the chance to visit several of the crown jewels in our national park system, including Rocky Mountain, Glacier, or Grand Teton National Park. Of course the Great Smoky Mountains, the most visited national park, never charges a fee. Great Smoky Mountains National Park officials celebrated the completion of a 2-year trail rehabilitation project on Alum Cave Trail today, November 17. Alum Cave Trail is one of the most popular trails in the park, leading hikers to iconic areas including Arch Rock, Inspiration Point, Alum Cave Bluffs, Mt. Le Conte, and LeConte Lodge The trail was reopened, on schedule, following work completed by the park Trails Forever crew, American Conservation Experience youth crews, and volunteers. The Trails Forever crew rehabilitated targeted locations along the 5-mile trail to improve visitor safety and stabilize eroding trail sections. Park rangers respond to numerous accidents along the trail each year, especially along the upper, narrow corridors. The much-needed rehabilitation improved overall trail safety, while also protecting natural resources by repairing historic cable and handrail systems, reinforcing hanging trail sections, reducing trail braiding, and improving drainage to prevent further erosion. Before the rehabilitation, the trail had several narrow areas where erosion and small landslides had damaged significant sections of the trail, making it difficult to safely travel through the areas during inclement weather or to pass hikers coming from the opposite direction. The crews were able to restore these fragile trail sections allowing long-term sustainability that protects trailside natural communities from degradation. By building an attractive, durable trail surface to hike upon, the crew successfully narrowed the trail corridor impact zone. This is the first major rehabilitation of this trail since its original construction. Through the thoughtful rehabilitation techniques using natural materials, the historic nature of the trail has been preserved allowing future visitors opportunities to enjoy the unique trail for years to come. In 2012, Friends of the Smokies established the Trails Forever endowment thanks to a matching gift from the Aslan Foundation in Knoxville. Today, the $5 million endowment funds a full-time trail crew to focus reconstruction efforts on high use and high priority trails in the park including Alum Cave Trail and the recently restored Chimney Tops Trail and the Forney Ridge Trail to Andrews Bald. The program also provides a mechanism for volunteers to work alongside the trail crew on these complex trail projects to assist in making lasting improvements to preserve the trails for future generations. I had a chance to hike the Alum Cave Trail about three weeks ago, and saw the changes made to the trail first hand. I can say with certainty that the Trail Forever crews did an outstanding job. 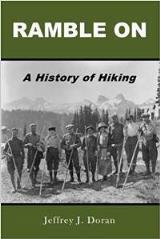 As a result, I've updated the Alum Cave Trail page on HikingintheSmokys.com with new photos and an up-to-date description. In 2017, the Trail Forever crew will begin a 2-year rehabilitation project on the popular Rainbow Falls Trail. The trail and associated parking areas will be closed May 8, 2017 through November 16, 2017 excluding federal holidays, on Monday mornings at 7:00 a.m. through Thursday evenings at 5:30 p.m. weekly. Due to the construction process on the narrow trail, a full closure is necessary for the safety of both the crew and visitors. The trail will be fully open each week on Friday, Saturday, and Sunday. Great Smoky Mountains National Park officials have issued a ban on all campfires and use of fire grills throughout the park effective immediately. Due to continued dry conditions and widespread wildfires throughout the region, park officials have issued the parkwide ban to further reduce the risk of escaped fires. The fire restriction will be in effect until further notice. The fire ban applies to the use of all campfires and grills throughout the park including frontcountry and backcountry campsites and picnic areas. No use of wood or charcoal fires is permitted. In addition, park visitors are reminded to extinguish all cigarettes, cigars, and pipes and dispose of them in appropriate containers. At this time, campers may continue to use gas camp stoves at designated campsites throughout the park. Backpackers should be aware that these dry conditions affect the availability of water at springs at backcountry campsites and shelters throughout the park. At some locations where there is a running spring, it can take more than five minutes to fill a quart-sized bottle. The following backcountry campsites are currently known to be without water: 5, 6, 14, 16, 19, 26, 113, Mollies Ridge Shelter, Russell Field Shelter, Spence Field Shelter, Silers Bald Shelter, Double Spring Gap Shelter, and Pecks Corner Shelter. Other campsites may be without water as the drought conditions continue. Backpackers are encouraged to carefully consider their itinerary and carry extra water for those sites that are not located along major water sources. For more information about backcountry trip planning, please visit the park website at https://www.nps.gov/grsm/planyourvisit/backcountry-camping.htm or call the backcountry office at 865-436-1297. Great Smoky Mountains National Park officials invite the public to comment on a proposed sustainable energy project through December 13, 2016. Duke Energy has proposed installing an array of solar panels, coupled with a zinc-air battery, to power critical park communications equipment located atop the remote Mt. Sterling in the Haywood County area of the park. Duke Energy currently delivers power to the site along a 3.5-mile overhead line that extends from the park boundary at Mt. Sterling Road (Hwy NC284) to the Mt. 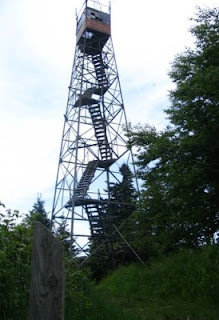 Sterling Fire Lookout Tower. The radio equipment is a vital component of the park’s emergency communication system. The solar microgrid would operate separately from the energy grid and would allow greater reliability while using a renewable energy source. The proposed solar array would consist of 30 panels and would cover an area approximately 40 feet long, 15 feet wide and 10.5 feet tall at the highest point. A small area south of the panels would need to be kept free of tall trees to minimize shading. Current estimates show that fewer than 10 trees would need to be cleared. If approved and installed, the microgrid would allow the existing overhead line to be decommissioned and the existing maintained corridor would return to a natural state. Park staff have initiated the National Environmental Policy Act, National Historic Preservation Act, and other compliance processes to evaluate potential adverse and beneficial impacts of the proposed project on the natural, cultural, and human environment. Staff invite the public to comment on the proposed project using the National Park Service’s Planning, Environment, and Public Comment (PEPC) website and following the link titled “Mt. Sterling Sustainable Energy Project” at https://parkplanning.nps.gov/grsm or by US Mail to Superintendent, Great Smoky Mountains National Park, 107 Park Headquarters Road, Gatlinburg, TN 37738. Duke Energy recently filed details on the proposed project with the North Carolina Utilities Commission, which must approve the project prior to implementation. If approved by the National Park Service and the North Carolina Utilities Commission, implementation could begin in Spring 2017. I just saw this now, but the Great Smoky Mountains National Park announced on their Facebook page yesterday that a firefighting crew continues to monitor the 0.25 acre wildfire burning near the summit of the Chimney Tops Trail. The fire currently remains within the containment area established by the crew yesterday. Trails are expected to remain closed through Tuesday, November 15th. Closed trails include: Chimney Tops Trail, Sugarland Mountain Trail, Huskey Gap Trail, and Road Prong Trail. The ground fire continues to produce a significant amount of smoke, but is primarily burning in the duff layer with flame lengths less than 12 inches. The cause of the fire remains unknown. Planning a Visit to the Smokies This Holiday Season? 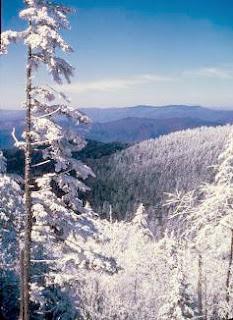 Planning a visit to the Great Smoky Mountains this Holiday Season? 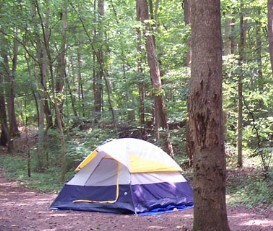 Please help support HikingintheSmokys.com by supporting the sponsors on our Accommodations page. Our hiking website provides links to a wide variety of overnight options - from cozy cabins to luxurious resorts. A joint information center is now open to provide timely and accurate information about wildfires in western North Carolina and related issues. This one-stop information center will provide the public with updates on wildfires, evacuations and shelters, road and trail closures, air quality, current burning restrictions, and the schedule for public meetings for wildfires. The center will be staffed by US and NC Forest Service public information officers, county emergency management officials, public health officers, and wildlife resources commission staff. Call 828-575-2840 from 8 am to 8 pm or email ncjicinformation@gmail.com. Information will also be posted at http://ncjic.blogspot.com. The U.S. Forest Service has implemented a closure for the entire Citico Creek Wilderness and the portion of the Joyce Kilmer-Slickrock Wilderness located in the Cherokee National Forest (Tennessee). This closure has been put in place for public safety due to wild fire activity in the Joyce Kilmer-Slickrock Wilderness in North Carolina. 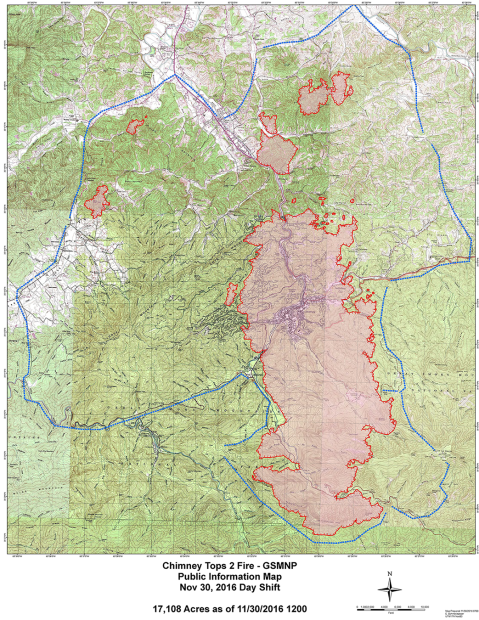 o Closure Pursuant to 36 CFR 261.52(e) – Going into or being upon any area of the Citico Creek Wilderness and Joyce Kilmer-Slickrock Wilderness within the Cherokee National Forest. National Forest visitors are asked to obey all state and federal fire related laws and regulations. If you see smoke or suspicious activity contact local fire or law enforcement authorities immediately! The Nantahala and Pisgah National Forests are implementing a TOTAL FIRE BAN due to the extremely dry conditions, high fire danger, and little chance of rain in the immediate forecast. Beginning on November 10, 2016, the following restrictions are in place for the Nantahala and Pisgah National Forests until further notice: Building, maintaining, attending or using a fire or campfire (including charcoal based fire whether in a grill or not) is NOT ALLOWED anywhere on the National Forest. The Blue Ridge Parkway announces fire restrictions in both the NC and VA sections due to extremely dry conditions, high fire danger, and little chance of rain in the immediate forecast. Building, maintaining, attending or using a fire, campfire, or stove fire is not allowed. The use of portable lanterns, stoves, or heating equipment that utilize gas or pressurized liquid fuel is allowed. Charcoal fires are not allowed. This applies to all picnic areas that remain open and accessible for use. The entire Cohutta Wilderness Area in the Chattahoochee-Oconee National Forests (Georgia) and the Cherokee National Forest (Tennessee) is now closed to public entry. This closure has been put in place for public safety due to the increase in wildfire activity in the Cohutta Wilderness. According to the USFS notice, the wilderness will be closed until 12/13/16. 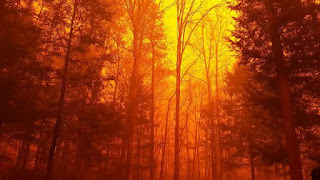 Due to a wildfire that started on Monday, Daniel Boone National Forest officials have temporarily closed a portion of Tunnel Ridge Road #39 and some national forest lands in the Red River Gorge. The closure order prohibits anyone from entering or being on Tunnel Ridge Road past the Grays Arch trailhead parking area and all national forest lands south of Tunnel Ridge Road, west of the Sheltowee Trace Trail #100, north of the Mountain Parkway, and east of private lands in this vicinity. The road is closed to vehicle and foot traffic. On Tuesday morning, the wildfire referred to as the Woodland fire had burned more than 90 acres of national forest land. The fire is expected to burn over 300 acres before it is contained. The cause of the fire is under investigation. The DBNF currently has a fire restriction order that prohibits any campfire or open flame outside of designated recreation areas. In the Red River Gorge, fire is only allowed at the Koomer Ridge Campground and three Forest Service picnic areas. In designated recreation areas where an open fire is permitted in the national forest, the fire must be contained in an existing fire ring or pedestal grill installed by the Forest Service. In fire restricted areas, a $300 fine will be issued to each person attending an illegal campfire. Any person or group responsible for causing a wildfire may also be held liable for fire suppression costs, which can become extensive once firefighters and heavy equipment are needed. Anyone violating the fire restriction order and causing an uncontrolled wildfire could be charged with a felony of wanton endangerment if firefighter and public safety are put at risk. Fires on national forest land may be reported by calling 911 or the nearest Forest Service office. If you suspect anyone of arson, call 1-800-27-ARSON. Due to the extremely dry conditions currently being experienced, Big South Fork officials have determined that it is necessary to prohibit the use of all open fires and activities, which unduly increase the fire danger. The term "open fires" refers to any flame source not immediately extinguishable or controllable and applies to any form of wood or charcoal-based fire. Superintendent Niki Stephanie Nicholas announced the ban today, in an effort to lessen the dangers of wild fires in the park. Within those exempted areas, fires will be permitted only within established and actively monitored fire rings. • Stir the coals to wet all the embers. • Keep a shovel and water close at hand. • Feel to ensure that the coals are dead out. • To extinguish your fire, drown the fire with about 5 gallons of water. * Appalachian Trail from Nantahala River to Burningtown Gap closed due to new fire that started Thursday afternoon. The Tellico Fire is actively burning in that area. The closure also includes Wesser Creek Trail in the same area. * Appalachian Trail closed from Rock Gap to Winding Stairs Gap. Old 64 Murphy Road closed from its west junction of US 64 to Forest Service Road 67 leading to Standing Indian Campground. Rock Gap may be accessed from the south by going through Coweeta Hydrologic Laboratory. Closures have resulted from Knob Creek Fire that started Wednesday. * Bartram Trail is closed between Wine Springs Bald and Nantahala Lake due to Wine Spring Fire. * Bartram Trail, from Hickory Knoll Road to State Highway 106, will remain closed through this weekend due to mop up operations and potential hazard assessments from Jones Gap Fire. The fire ban only applies to campers utilizing the park’s 100+ backcountry sites and shelters. It does not affect campers at the park’s 9 frontcountry (developed) campgrounds or picnickers using fire grills at picnic areas. Fires at developed areas must be confined to designated fire rings and grills. All visitors are asked to take certain precautions to help reduce the risk of wildfires. This includes extinguishing frontcountry fires by mixing water with embers in fire rings and grills. Use of backpacking stoves is still permitted at backcountry campsites. Backpackers should be aware that this situation affects the availability of water at springs at backcountry campsites and shelters throughout the park. At some locations where there is a running spring, it can take more than five minutes to fill a quart-sized bottle. The following backcountry campsites are currently known to be without water: 5, 6, 16, 26, 113, Mollies Ridge Shelter, Russell Field Shelter, Spence Field Shelter, Silers Bald Shelter, Double Spring Gap Shelter, and Pecks Corner Shelter. Other campsites may be without water as the drought conditions continue. Backpackers are encouraged to carefully consider their itinerary and carry extra water for those sites that are not located along major water sources.